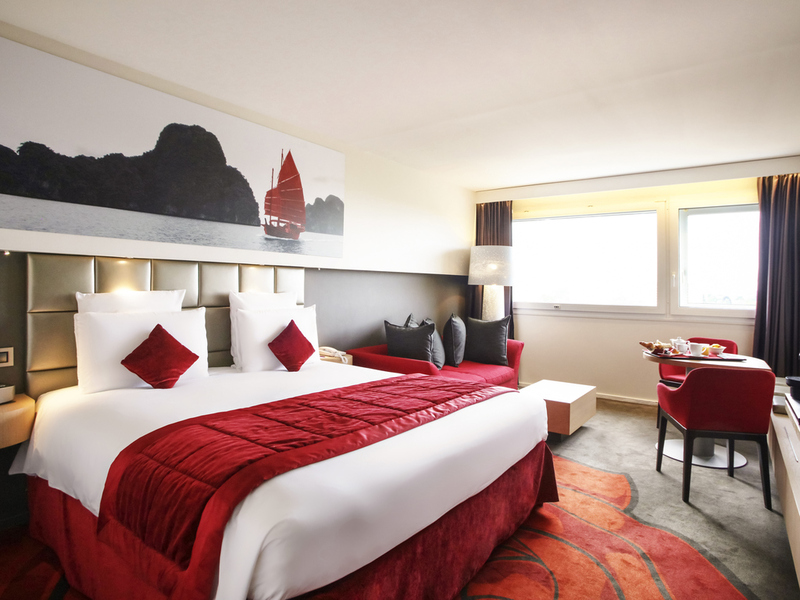 Mercure Orléans Centre is located along the Loire Riverside, 10 min walking distance from City Center. Walk along the borders and visit Ste-Croix Cathedral Easy access from the motorways (A10 and A71), rapid access to the Loire castles: Chambord, Blois, Cheverny, Sully sur Loire... What about a family trip to Beauval Zoo, 1h30 distance from us. We generally love staying at this hotel and have done this for over 15 year. The used to be always friendly, efficient and professional. This time the response the waiter when we asked for a carafe of tap water was very negative when he said that the carafes were reserved to the restaurant we asked the sommelier too who said the same and said he would not advise us to drink the water from the tap in the bedroom. He sold us a bottle of Evian. We were concerned to know what was wrong with the tap water as we drink it in the restaurant. The next day the reception staff seems surprised and were apologetic and did charge for the bottle of Evian. We must it is the first time we were refused tap water from an hotel. The waiter was rather unfriendly. F. l.
Good reception -pleasant room with river view-easy secure parking-good location with river walks and relatively close proximity to town centre and cathedral. Breakfast good and evening meal also satisfactory. Everything was very smooth from the checkin to checkout. Reception staff were friendly and helpful. Had an excellent meal in the restaurant with great service. The staff accommodating, dogs in the hotel is not..
Our stay was for four days. The staff made sure to make us feel welcome. The restaurant was great. Letting dogs into your hotel not great. Dogs may be a friend to their owner, but not so to others. When asking about letting dogs into the hotel I was told that it was encouraged. Letting dogs sleep in any of the rooms in your hotel is not acceptable. Just the thought of sleeping in a bed that a dog slept in was very uncomfortable. It may be great for the dog's owner, but those of us who do not have pets we should not have to endure their wishes. Even though you may charge 8 Euros for the pet you cannot tell me that the minimal amount charged covers for the potential of flees in the room, bed, blankets, pillows and carpet that dogs leave behind. Also, when did it come down to that a pet overrides a human when staying in a hotel. Who is the paying customer? By the way one dog was known for biting and was acknowledged by staff to have bitten them. Why do I have to worry about such things when staying as a guest. Also, some of us are allergic to pet dander. It may open you up to further complications when a hospital visit is required when staying in your &quot;dog friendly&quot; hotel. Tell your customers to not be so cheap and kennel their dogs. The eight euro's is a bargain for them, while causing us to have to endure their companion status. Finally, there is no notice on your website or when calling that you allow dogs. Heads up folks this is a major consideration issue. Dear MICHELLE P., Thank you for taking the time to tell us about your experience at the Hôtel Mercure Orléans Centre. I am sorry that your experience did not meet your expectations; please allow me to express my sincerest apologies. At Mercure, we strive to provide a superior service experience for every customer; therefore your feedback is very important to us. Please rest assured that we are taking the appropriate measures to address the problem and prevent future occurrence. Please note that we have always welcomed pets in the hotel and that the fee is to clean up the rooms according to necessary after a pet came into the room. We appreciate your sharing your concerns, and it is our hope that you will give us the opportunity to better serve you in the near future. Sincerely, Mrs Julie Duclos, Hotel General Manager. nice and close to the center, inside the hotel everything looks fine. the shower was a bit weak and the shower area was a bit small. Really great service in every department. Lovely food in the restaurant and a wonderful selection for breakfast. As always, welcoming staff. The bar area is a pleasant place to sit. Good meal. Old hotel, but okay. The staff at the restaurant is very pleasant. We again enjoyed our stay.Everything was as expected.Friendly staff,comfortable room and a very good meal.We are sorry that the senior breakfast offer has been withdrawn by Accor with effect from 01/01/2019 without any prior notice to Loyalty club members.This could affect our future choice of hotels booked!! Quite nice, but the building itself could be much nicer! Pleasant and helpful staff. Lovely city. Bright and cheery bar area. Parking on site. No complimentary drink or upgrade for gold Accor members. very good expeerince, calm and peaceful hotel. Good service, cleaned premises and good level of attention from the staff. The only negative was the fact that there was no food available on the week end as the restaurant was closed. We were very happy with our stay! The room was perfect, the food in the restaurant very tasty, it was a very relaxing stay over. I am still surprised to get one drink offer as silver member when i am also with my wife and my kid. While outside of France this Policy doesn't exist, it is petty. A very comfortable stay, in a good location with secure parking. Very pleasant and helpful staff. Welcoming entrance area, bright and modern. Very generous size of room, and comfortable.